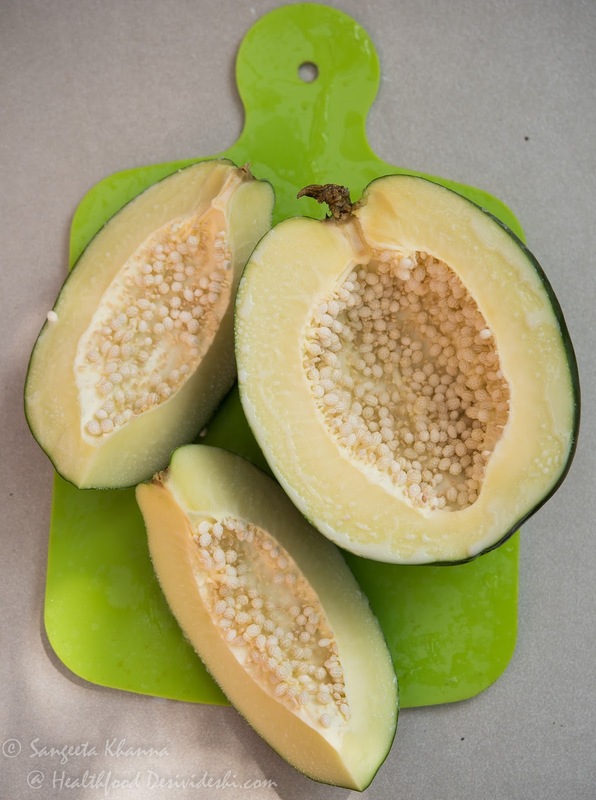 Green papaya is one of the most useful ingredients when you think about cleansing your system. Some people swear by the efficacy of green papaya so much that they eat boiled and mashed green papaya for it's cleansing properties. The enzyme found in green papaya is called Papain and is a powerful exfoliating agent for skin. I used to make body scrubs using raw papaya when I was younger and have found it really good for the purpose. I will share the recipe sometime soon. We love green papaya and make parathas with it. The raw papaya and carrot raita is a recipe I keep repeating every season. 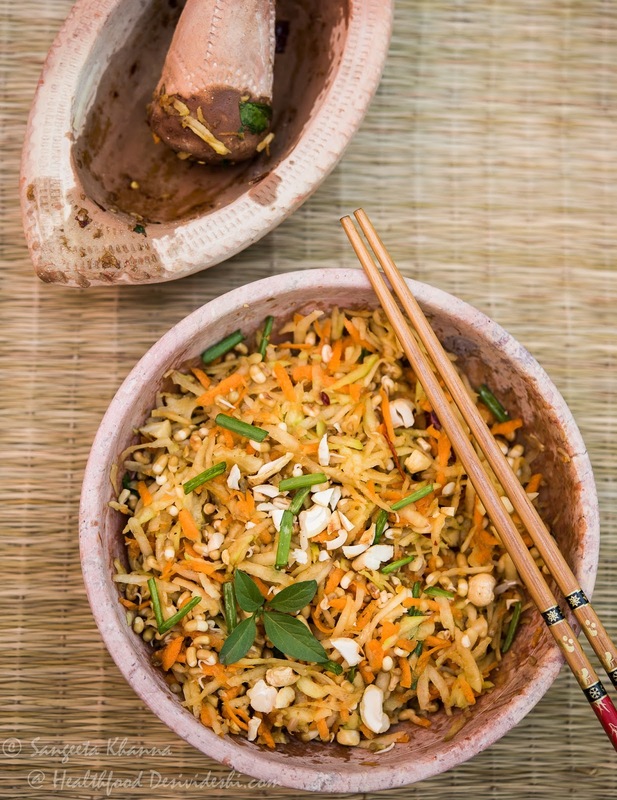 I have been making Som Tam every season too and have been loving it but when I saw Chef Yenjai of Neung Roi making green papaya salad using a large wooden mortar and pestle I realized what was missing from my recipe. 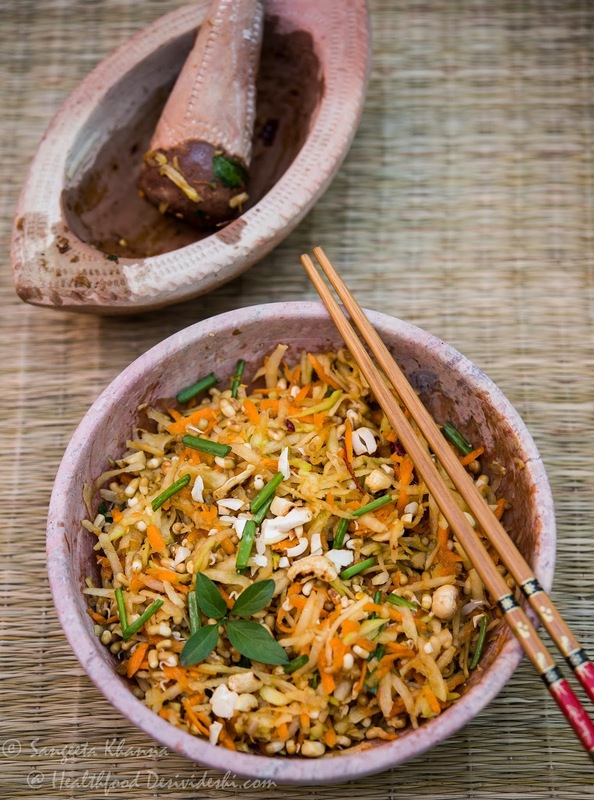 This papaya salad (Som Tam) needs to be muddled a little with the dressing to get the best taste. Earlier I used to fuss about getting Thai bird chillies and fish sauce and what not, now I just muddle and let the everyday ingredients turn into a delicious salad. For authentic recipe of Som Tam you can refer to this page. But honestly speaking I have one exotic ingredient that proves really useful when making this salad and that is dry shrimps. I had brought very good quality dry shrimp from Goa a few years ago and that is still keeping well. It is used in such minimal quantity that it lasts forever. But if you don't have that or if you want a vegetarian version of this salad you can brown some onions and use them instead. I can't think of a better substitute for dry shrimps. Heat the oil and add the red chillies and dry shrimps to it. Cook for a couple of seconds till the chillies and dry shrimps sizzle and emanate the shrimp aroma. This aroma may not feel good but trust me it translates to great taste in the final salad. Take care not to burn the ingredients. Transfer this fried dry shrimp and red chilies to a mortar and pestle add all the other dressing ingredients and muddle lightly. Add half of the grated papaya to the pestle and thrash some more to muddle the salad. It will be better if your instrument is bigger so you can muddle all the grated salad ingredients together. I generally pour the contents of the mortar and pestle into the salad bowl and muddle again for a while so the grated papaya and carrots get macerated a little. Sprinkle with chopped nuts and serve right away. I make it a little hot and both of us eat this salad from the same bowl mostly, always fighting for the last few shreds. The salad is that good. Sometimes I pack it for Arvind's lunch box and I feel grateful that he started liking salads. 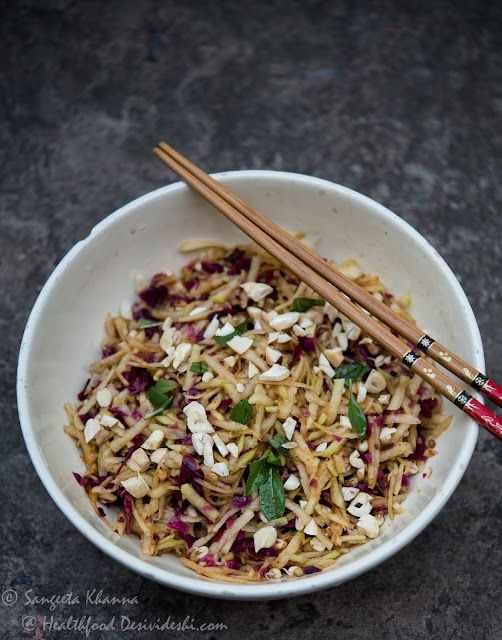 Adding Sauerkraut to this green papaya salad was the most amazing ideas that came to me. Trust me this version is so good you will start making Sauerkraut just for this salad of nothing else. Just replace the summer carrots with sauerkraut, chopped finely if you wish for better distribution through the salad. The dressing remains the same for this version too. In fact this dressing is so good you could make the same salad with shredded cabbage too. You could add steamed beans to this salad if you wish. I generally chop the green beans or yard long beans (lobiya) into very thin shreds (slanted cuts) and add it to this salad. Using a little more sprouts is also good if you wish. Hope you will try these salads with green (raw) papaya and share your feedback with me. Making salads without the salad green is so much easier if you ask me. You don;t have to worry about how crisp or fresh the lettuce is. Making summer salads is fun if you find out what you like and play with textures and flavours a bit..